We wish that Satan were not real. The Christian life is hard enough on its own without having to do daily battle against an invisible spiritual enemy bent on our destruction and misery. We already wrestle against our own sin, the sin of others, and the trials of living in a fallen, sin-cursed world. This spiritual struggle is a good thing, because it is a sign that we are alive in Christ, fighting to put to death our old sinful nature and live the new life of the Spirit. But Peter reminds us today that our battles as believers are also made harder because of the work of our ancient adversary, called “Satan” and the “devil” and many other names in the Bible. Some professing Christians choose not to believe in the devil. But that does not make him any less real. Read any of the gospels and you will see the activity of Satan and his demons all over the place, constantly opposing Christ and His ministry. Read Acts and see the devil moving human enemies to oppose the missionaries and the spread of the gospel. As C.S. Lewis has said in Mere Christianity and The Screwtape Letters, we err both when we pretend that the devil is not real and when we paint imaginary pictures of him in our media and minds as a mischievous little red creature with a tail and horns. The real Satan of the Bible is a fallen angel, a deceiver of the human race and both our enemy and the enemy of our Father in heaven. He blinds lost people to their true spiritual condition, leading them unknowingly down the broad road that leads to hell. Once a person believes in Jesus Christ as Savior and is born again by receiving the Holy Spirit, Satan then switches tactics. He tempts us toward sin, and he afflicts us with doubts about our relationship with God. He tries to prevent our growth in Christ and steal our joy. And he also acts like a “roaring lion,” assaulting our faith with fiery trials and persecutions. We are told that we must always be on guard against the attacks of his demonic forces (“be sober, be vigilant”) which can come at any time. We must “resist him” by clinging to Christ in prayer and by learning and believing the promises of Scripture. And we must stick close with other Christians who also experience his attacks. Once you’re saved, you’re in the war. There is no choice about it. 1. Why do you think that Satan wants people to either not believe he exists or to imagine him as a cartoonish figure? How has your understanding of who Satan really is changed since you were a little kid? 2. Are you aware of the common temptations and attacks that Satan has been using against you? Once you become aware of your spiritual weaknesses, you can seek help from more mature believers like your parents, pastors, and teachers in directing you to Bible verses and concepts to help you resist the enemy and stand strong in your faith. 3. Do you regularly pray with other Christians to help you in your walk with God? If not, seek out opportunities for this kind of spiritual fellowship in your home, at church, or at school. To be strong in our faith, we need to be gathering with other believers regularly for serious prayer. A teacher can help you find such a group if you ask! Years ago I remember hearing a Fourth of July weekend message called, “Our Declaration of Dependence.” It was at a small church in a small town in Nebraska, and when I saw the sermon title in the bulletin, I thought it was a typo, a Microsoft Word mistake. It was not. When I think back on that message now, I understand what the preacher was talking about. I don’t remember what passage he taught, but the theme of his sermon, our need to humbly trust in the Lord for everything, is certainly what today’s verses from 1 Peter teach us. Peter has just challenged believers in 1 Peter 5:5 to humble themselves under the leadership of their pastors and to show humility before God and others. In verse 6 he presses the need for humility again. If we want to be of use to God, to be great in His eyes, we must get low before Him. For Christians, the way up is down. We want to humble ourselves now rather than be humbled by God’s “mighty hand” of discipline later. I’m sure many of you would prefer to do what your parents want first instead of getting in trouble and being punished and then still having to do what they tell you to do. Like our parents (and probably more so! ), God is patient and long suffering with us, not giving us the treatment that we deserve. As verse 7 tells us, God really “cares for us,” which means that He loves us and His plans towards us are for our good. But those plans for our good include making us humble like His Son Jesus, making us decrease so that He can increase in our lives. If we continue in proud rebellion and selfish independence and keep boasting of our own greatness every day, we cannot be surprised if God sends hard consequences against us. The better way is to stop thinking about ourselves and instead put our trust in the Lord. Take your cares and worries, the stuff that is keeping you up at night and causing you to be anxious and afraid, and lay them down at the feet of Jesus. We must kill fear and replace it with faith. Every Christian must choose to fight this fight against pride and self every day. But the good news is that God is for us and not against us. He has given us the Bible and His Holy Spirit and the fellowship of other Christians to help us become humble and learn to trust in Him. May His Word, Spirit, and people soften our hearts again today. • Peter’s reference to the “mighty hand of God” in verse 6 is probably talking about the suffering that these Christian readers are facing and will be facing in the future. Everyone suffers in this life, but not everyone is made humble by that suffering. The challenge for Christians is to not become bitter, but to let the difficulties of life send us closer to the feet of Jesus. • Verses 6 and 7 are logically connected. When we humble ourselves before God, it should change the desires of our hearts and what we care about it. The “cares” that we cast before the Lord in prayer should become more and more focused on His kingdom and the true needs of His people and less and less on selfish and sinful wants that hurt our walks with Christ. 1. It has been said that pride is like bad breath; everyone knows that you have it but you. Ask some friends or family members if they see any pride in your life. You might be surprised (for good or bad) at what they say! Either way, this can be a humbling experience for you. 2. What are your greatest cares and worries right now? Take a couple minutes and list them on a piece of paper. Then lay the list down in front of you as you pray. This concrete exercise may help you to visualize casting your cares before the Lord who cares for you. Sheep needs shepherds. Left to their own, sheep will wander, starve, and be wide open to attacks from predators. To lead His sheep, Jesus appoints shepherds that will guide, feed, and protect them. True, Jesus will always be the “Chief Shepherd” of His church (1 Peter 1:4). He is the head and we are His body (Colossians 1:18). He alone is our Lord and Savior, the “Good Shepherd” who has given His life for His sheep (John 10:11). But in today’s passage, the apostle Peter reminds us that Christ chooses earthly shepherds to lead His church on His behalf. Pastors (another term for shepherds, who are also called “elders” and “bishops” in the New Testament) are appointed to oversee or guide the church. The church members are charged to humbly submit to the leadership of the pastors, who in turn are charged to humbly lead their churches by setting a high standard of spiritual maturity and grace. Pastors shepherd their flocks mainly by feeding them from God’s Word. Pastors should faithfully and accurately teach and oversee the teaching of the Bible. A flock’s spiritual strength is directly related to the quality and depth of the Bible teaching that it regularly receives. Strong preaching and teaching of the whole counsel of God leads to strong believers living out the will of God in their daily lives. When a church receives a steady diet of explanation and real life application of the Bible, they are given guidance in how to walk on the path of life and protection from the false ideas and desires that would lead them down the path of death. Pastors should do this work of teaching, guiding, and protecting Christ’s church with gladness. Though they face many hardships in ministry, they should experience joy in teaching and guiding God’s people. While churches should pay their pastors fair salaries for their service (1 Timothy 5:18), pastors should not serve the Lord just to make money. And while pastors must exercise authority and oversight in leading their congregations, they must do so with humility, knowing that they have a Boss in heaven who will hold them to a stricter standard of judgment when He returns. As the younger people that Peter describes at the end of today’s passage, your job is to follow the shepherds that God has given you. This begins with becoming part of a healthy church with godly leadership. Not perfect pastors, but godly ones who are humbly and faithfully teaching the Bible so that their church members can grow spiritually. Such churches do exist in the North Raleigh area! Any of your teachers would love to help you and your family find a church home. It is our heart’s desire as a Christian school to see all of our students and families joyfully participating in the life of a local church. Some of you are members of good churches, but you aren’t going often enough to let Christ guide you as He desires. You’re missing out on the abundant life that Jesus promised His followers because your connection to the body is too loose, which means that your connection to the cares of this world is what’s really leading your life right now. Christians living apart from the body are going to wander and starve spiritually and may fall victim to the wolves of the enemy if they spend too long alone in the wilderness. God’s message to you is to spend more time with the flock where He has placed you so that He can lead you by the still waters and into the quiet green pastures where His sheep belong (Psalm 23). Finally, to those of you who are well-connected to a biblical church, the challenge is to not just go through the motions each week during services and Bible studies. Every time that we gather with the body of Christ to worship and hear the Bible taught, we choose to either submit to the Lord with a willing heart or to ignore Him and reject His Word. The reminder at the end of today’s passage should be powerful motivation for us to keep trusting and obeying the Lord, to keep surrendering to God’s leadership of our lives: “God resists the proud, but gives grace to the humble” (1 Peter 5:5). • It is important to note that in verse 1, Peter refers to himself as a “fellow elder” with the church leaders to whom he is writing. Even though he was one of the 12 disciples and an apostle, Peter does not claim any special authority over these pastors and churches. Rather, he speaks to them as fellow followers of the real “Chief Shepherd,” Jesus Christ. • In bigger churches, students and parents can sometimes feel anonymous and not have personal relationships with the pastors. Most of these churches encourage families to participate in small groups or Bible study classes. If you feel disconnected at your church, consider getting involved in one of these smaller subgroups of believers. These groups or classes are usually led by godly men and women who have closer relationships with the pastors and act as “mini-shepherds” to help the pastors guide their large flocks. 1. In what ways have you and your family allowed your pastors to shepherd you? How could you do a better job of letting your pastors lead you spiritually? 2. Have you ever imagined what it must be like to be a pastor? What do you think are some of the greatest challenges and frustrations that pastors face in trying to do the jobs that God has given them? It’s hard for people to get saved. I’ll say that again. It’s hard for people to get saved. Yes, in one sense salvation is simple. The gospel message is clear enough for a child to understand – repent (turn from your sins) and believe (put your trust/faith) in the Lord Jesus Christ. But in another sense salvation is totally impossible without the miraculous work of God’s Holy Spirit. The human heart without Christ is hardened and dead and the mind of the lost person is spiritually blinded by sin and Satan (see for example Ephesians 2:1-3). It’s takes the power of God to bring the unsaved person out of the darkness and into the light. That’s what Jesus was talking about when He addressed the disciples as the rich young ruler walked away crying bitter tears. The young man was religious and wealthy and had come to Jesus seeking eternal life. He really thought that he had totally kept the Ten Commandments but still felt something missing inside. Jesus told him to give up all his stuff and follow Him, but the man would not; he realized that his wealth was his god and his love of his money was THE obstacle to him having a saving relationship with God. As the man walked away, Jesus commented twice about how hard is was for the rich to enter the kingdom of God. This blew the disciples away, and they naturally asked Jesus if anyone could be saved. Jesus replied, “With men it is impossible, but not with God; for with God all things are possible” (Mark 10:27). In a different conversation with a similar but older man, the Pharisee Nicodemus, Jesus again emphasized the supernatural work of God that must occur for someone to be saved. “Do not marvel that I said to you, ‘You must be born again,’” Jesus told him. “The wind blows where it wishes, and you hear the sound of it, but cannot tell where it comes from and where it goes. So is everyone who is born of the Spirit” (John 3:7-8). And I believe that this is what Peter means in verse 18 of today’s passage, where he expands on Proverbs 11:31 under the guiding influence of the Holy Spirit and writes, “If the righteous one is scarcely (barely / with great difficulty) saved, where will the ungodly and the sinner appear?” (1 Peter 4:18). It is uncomfortable and painful to think that many of our loved ones may not have experienced true conversions. We want to believe that people who act nice, go to church sometimes (or at least to a Christian school), and know some Bible stories and verses must surely all be born again Christians. But when we really dig deep into the Word of God, we continually see these warnings from God about the dangers of false believers, those who have the “form (appearance) of godliness” but not the real “power” of godliness that can only come from the Holy Spirit living inside a person. This reality was certainly in Peter’s mind when he wrote that “the time has come for judgment to begin at the house of God” (1 Peter 4:17). Apparently, some great persecution of Christians was about to hit his first century Roman Empire readers, and this upcoming trial would test the church’s faith to the point that the false believers might be separated from the real followers of Christ. The real Christians would hang tough and persevere through the hardship, while the fake ones would give up the faith when it cost them too much. Peter thus called upon all of his audience to remain faithful to the Lord in their suffering and holy living and “commit their souls” to Him (1 Peter 4:19), trusting that even if they had to die for their loyalty to Jesus Christ, that would be okay because they would be saved and have the hope of living with Him in heaven forever. Better to suffer for Christ now and have the joys of heaven forever than to escape temporary pain by failing to “obey the gospel of God” but later suffer the fires of hell for all eternity. Today’s passage is short but deep and the applications are strong. First, “Examine yourselves as to whether you are in the faith. Test yourselves. Do you not know yourselves, that Jesus Christ is in you?—unless indeed you are disqualified” (2 Corinthians 13:5). Is there any evidence of faith in your life besides a childhood experience or prayer? Consider these evidences of real faith from Hebrews 10:19-26: 1) A confidence in approaching Jesus in prayer, 2) A new heart and a clean conscience before God, 3) Telling others about your faith in Christ, 4) Genuine love for other Christians, 5) A desire to do good deeds for others that comes from a growing relationship with Jesus, 6) A desire to spend time with other Christians, especially by worshipping and serving God in a local church, 7) A longing for Jesus’ return for His church, and 8) Turning away from sin (not perfection, but progress). Do at least some of these traits describe your life? If not, then I urge you to be honest with where you might really stand with God. Seek the Lord now, while He may still be near; don’t wait for life to punch you in the stomach before you really turn your life over to God. Every time the Bible talks about salvation, it is always with urgency and fervency, as if there may not be another chance tomorrow: “Today, if you will hear His voice, do not harden your hearts” (Hebrews 3:7). True believers will emerge stronger in the assurance of their salvation after examining their lives, but false converts will either wake up and really get saved (Amen!) or walk away from a faith that was never real, sometimes with anger and bitterness. My prayer is that you we would all find that we are safe in Jesus before the great trials of life come. The second and third applications of today’s passage would apply to those who know that they have really been converted to salvation. True believers are challenged in this text to never get over the miracle of their own salvation and to pray hard for God to convert their lost family and friends. When I read that “the righteous one is scarcely saved,” I am totally broken and thankful that God busted through my self-righteous, proud, and sin-hardened heart in the spring of my junior year of college to give me the gift of salvation. I am even thankful for the painful months of guilt and agony over my sinfulness that led up to the moment of my conversion, when I became totally exhausted from resisting the conviction of God’s Holy Spirit and prayed in my car, “God, I surrender.” When you look at your own salvation, recognize that it was a miracle of God. You did not get saved because you simply made an intellectual, logical decision to go a new direction in your life. You were “born from above” by an amazing act of God’s mercy and grace; never get over that! Which means that we should not judge our family and friends whom we suspect are not converted. Instead, we should be urgent and fervent in our love and prayers for them, as God commands us, laboring hard in the hope that God would give them the salvation that He has given us. 1. What evidences do you see in your life that you really have been converted and saved by God’s Holy Spirit? Assurance of your salvation is the most important issue you can ever settle in your life. Seek Christ until you find Him – He has promised to never turn away any who come to Him with honest pleas for salvation (John 6:37)! And don’t hesitate to seek out counsel from a mature Christian adult in your life like a parent, teacher, or Bible study leader. 2. How can you talk about your faith with someone who says they are a Christian but shows little evidence that they have really been converted / born again? 3. If you have trouble with developing a faithful and deep prayer life, try this. Make a short list of 2-5 people in your life whom you suspect may not be converted. Imagine them being separated from God and suffering in hell for all eternity. Now start praying! Sometimes people mistakenly think that life should have become perfect after they accepted Christ. That initial joy and excitement that they felt was so strong. They finally understood God’s grace and experienced the power of His forgiveness and salvation in their lives. They now knew what it was to have a right relationship with God. How could anything go wrong afterwards? I remember when I got saved in college, it seemed like everything was finally right in my life. Peace with God, love for Him and others, a new sense of direction and purpose for my future, finally having victory over my sinful anger issues (yeah, no, things got way better but God is still working on me with that!). But then life got tough again in a hurry – finishing my senior year with an honors thesis to write (it was a 45-page history paper! ), working from 5:30 p.m. to 1:30 a.m. on the sports desk of a newspaper four nights a week, and trying to learn how to survive and grow as a Christian by staying in church, reading my Bible, and spending time with more mature brothers in Christ. It felt like I had given the Lord control of my life at just the right time; I wouldn’t have made it without Him. The good news is that if you are a believer, the Lord is with you, and your struggles are not unusual. 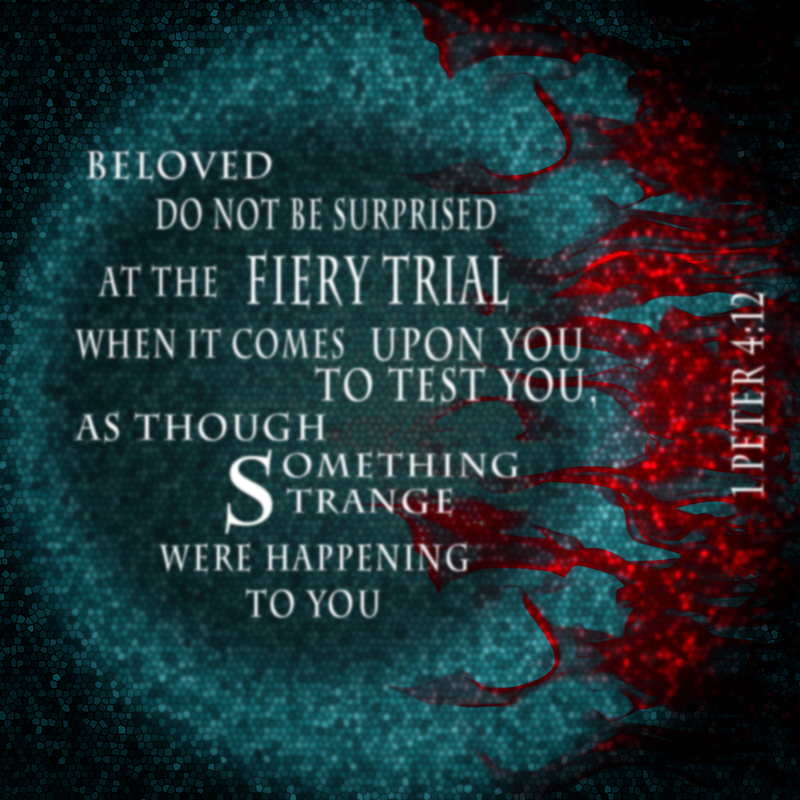 In today’s passage, Peter tells his readers, Christians suffering under the persecutions of the evil ancient Roman government and culture, that they should not consider their trials and hardships to be “strange.” Rather, they must remember that Christ suffered infinitely more for them, and that it is a great honor to suffer for our Lord’s sake. These words are true for us, too. As he has said before, Peter says again that we should not rejoice when our troubles are the result of our owns sins and foolishness. However, when we know that we are seeking to obey the Lord and we still struggle and face persecution because of our faithfulness to Jesus, then we should “not be ashamed” because we know that we are suffering as Christians. God is honored when we suffer for Him. Others may trash the name of Jesus, but we glorify His name even when it hurts us because we know that one day every knee will bow to that name above every name. At the same time, we realize that suffering is the spiritual furnace that God uses to burn off the junk in our lives and make us more like our Lord. The process is not fun, but it is how God makes us ready for His heaven. And remembering that, we can celebrate every day like we did when we first got saved. Suffering won’t be a stranger, but that’s okay, because our God has a plan for us and He will be with us until the end. • The Greek word translated “fiery trial” in verse 12 is used in only two other places in Scripture: Revelation 18:9 and 18:18. There it refers to literal burning, but it does not necessarily mean being burned alive in this passage, though that did happen during the Roman empire’s many persecutions (the emperor Nero is said to have used Christians as torches to light up his evening parties). We should instead understand it in a more general way as any kind of intense, harsh treatment by enemies of the gospel. • Verse 14 reminds believers of Christ’s promises about the Holy Spirit, who would come to live in His disciples at salvation and never leave them. In some supernatural way, the Holy Spirit strengthens Christians with His divine power when they are facing hardships and tests of their faith. If you have been a Christian for even a few months, you can probably already testify to times when you have felt God with you in a special way in the midst of your sufferings. 1. What challenges and difficulties did you face in the first few weeks and months after you accepted Christ as your Lord and Savior? How do you see those trials now as you look back at that time? 2. What kinds of persecutions or conflicts are you facing right now because of your commitment to living for Jesus Christ? 3. Can you think of a time when you felt God with you in a particularly powerful way as you faced a hardship in your life? How did that special sense of His presence strengthen your faith?